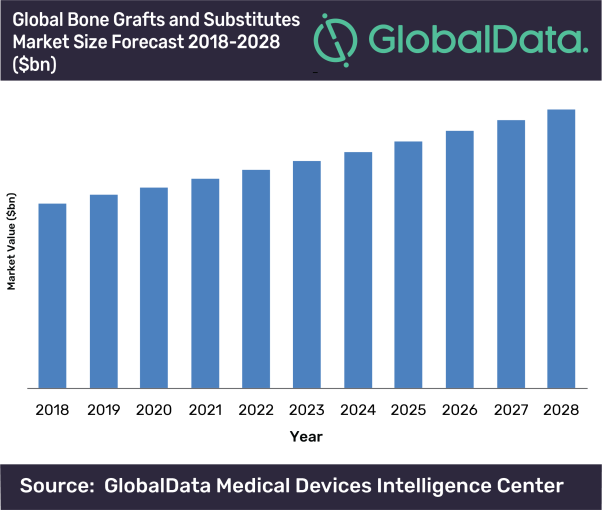 The global Bone Grafts and Substitutes market is expected to reach $3.2bn by 2028, growing at a Compound Annual Growth Rate (CAGR) of 4.2%, according to GlobalData, a leading data and analytics company. The company’s report, ‘Bone Grafts and Substitutes, Global Outlook, 2015-2028 reveals that Asia Pacific will be one of the fastest growing regions at a CAGR of 5.4% between 2018 and 2028, with North America and Europe following closely behind at 2.7% and 2.9% respectively. Synthetic Bone Graft Substitutes comprise the largest segment of the market, followed by allograft bone chips and bone morphogenetic proteins (BMP). Synthetic materials have been more easily acquired in the past, but organic products have been experiencing growth as they are approved in more countries. Barriers to market growth include a lack of clinical data on novel bone substitutes, and ongoing debates regarding many products cancer-related complications.